In general, consumers don’t directly buy their own solar panels. 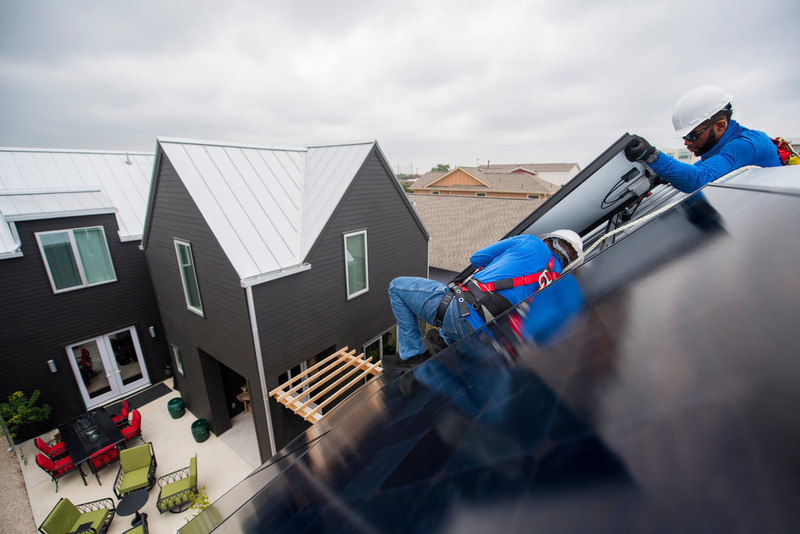 Instead, homeowners work with solar installers, such as our certified SunPower dealers, who will provide the solar panels, as well as the other needed equipment, and then install the solar system. It’s similar to buying a new central air conditioner system. You might select the air conditioner brand first, and find a local company who carries that brand; however, it’s that local installation company that will provide the right-sized unit, the ducts and the other components for you, and then safely install the system. So, then the question becomes: “How do I find the best solar installer to provide and install the right solar panels?” Here’s some advice on what to look for when buying home solar panels. Weather and sunlight vary from region to region, so you want to hire an installer who can design a system that works well in your climate. Plus every local municipality has different permitting and building code standards, and they change frequently. If your installer has a strong relationship with the local permitting offices and inspectors, it can help your installation go smoothly, avoiding potential hold-ups caused by changes in local codes or utility requirements. Also, to save costs, some companies have templated designs and might not be able to customize a solar system specifically for your home. Solar installers who specialize in a region or state can typically design a more much customized solar installation to fit special architectural needs or building materials such as tile or slate roofs. If you choose a SunPower® solar system, our solar dealers are based in your community. They are experts in local codes and will work with you on all aspects of your installation and will provide you with a customized design based on your energy needs, climate and type of roof. Not all solar is created equal, and there can be big differences in how a solar system is designed and manufactured that not only effect efficiency and performance, but also warranty coverage. It’s important to understand the basics of solar panel quality. Energy Sage, a solar company comparison site for consumers, offers advice on key factors to keep in mind when you're shopping for solar. You’ll want to make sure your solar installer lets you choose the solar panel brand for your home. Many companies will carry several solar brands and will use whatever they have in their warehouse at the time of your installation, which means you may or may not get the best panels for your needs. If you choose a SunPower dealer, you’ll not only get high-performance SunPower® solar panels, but you’ll also have peace-of-mind knowing your panels come with our industry leading 25-year Combined Power and Product Warranty and are backed by a company with a 30-year history. Many solar companies encourage buyers to use their solar financing packages since income from the financing is an important part of their business model. You won’t always be required to do that, but just be aware that you have a choice when it comes to solar financing. Some homeowners prefer to pay cash or take advantage of the popular low-interest/zero-down loans. So find out whether this as an option offered by your solar installer. Smaller regional solar installers are typically more flexible when it comes to financing a home solar system. While many SunPower dealers have access to SunPower Financing, their main business is installation, not financing. If you’d prefer a straight home equity loan through your bank, that’s fine with our dealers. In summary, there are many solar companies to choose from. If you are looking for a customized system design with high-performing and durable solar panels, installed by a local business in your community, look no further than SunPower.